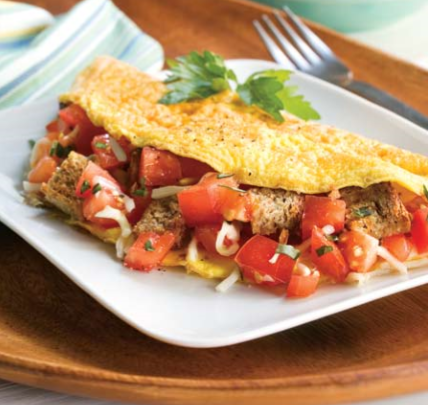 This unique omelet includes vegetables and whole wheat bread for a balanced breakfast. Makes 1 serving. 1 omelet per serving. Cut the bread into cubes; toss with oil and garlic in a small bowl. Spread the cubes in a single layer on a baking sheet and toast in the oven for 15 to 25 minutes, or until golden brown, tossing once or twice. Transfer to a plate to cool. Spray a medium pan with nonstick cooking spray and heat over medium-high heat. Pour in egg substitute. When the egg begins to set, spread evenly across the bottom of the pan and reduce the heat to low. Once the top layer of egg is almost cooked, sprinkle the cheese and basil on top and scatter the tomatoes and bread over half of the omelet; fold the unfilled omelet half over the filling. Calories 235, Carbohydrate 18 g, Dietary Fiber 5 g, Protein 27 g, Total Fat 7 g, Saturated Fat 2 g, Trans Fat 0 g, Cholesterol 8 mg, and Sodium 506 mg.
Organic garlic is well known and is widely used to treat and prevent colds and flu. A study done in the UK suggests that the participants who took garlic supplements were “less likely to get a cold and recovered faster if infected.” Include organic garlic in your diet and you will not need antibiotics. They are heart-healthy foods mostly due to lycopene, which is a powerful antioxidant that gives tomatoes their red color. Our body cannot produce lycopene so it must come from food sources. This potent carotenoid and phytonutrient help neutralize free radicals in our body. Tomatoes are also packed with vitamin E and C, which are great for heart health.